Here we are, the four of us together. It’s 1950, I’m guessing; it’s probably Thanksgiving (or Christmas – I’ve got red bows tied around my braids...) and we’re here for dinner, I’m sure. And...look at those suspenders! My brother and I both have them (not an exclusively male fashion statement, clearly), and even though we both look faintly uncomfortable, we’re holding our own. Whenever I look at this photograph, I’m catapulted back through time to my paternal grandparents’ house in Newton Highlands (right outside Boston) – a tan house with brown trim that perched on the upper end of the avenue. It had an entry way, a dining room; kitchen and breakfast nook (with a black-and-white tiled floor that my grandmother washed in two stages...once for all the black tiles, once for all the white); an enormous living room with fireplace, plenty of couches (one antique horsehair one that pricked at the backs of your legs) and a couple of comfy chairs, and this bookcase at one end near the french doors. I’ve got some of these same books in my bookcase; my brother has others. My father’s wearing one of his ever-present bow ties; I remember the gray and yellow sweater vest my mother made for him (just peeking out from inside his jacket). Above his head are photographs of his sister and her husband and an old daguerreotype of a Gould ancestor that now sits on a shelf here in Maine. That lampshade above her head fascinated me. When the light was on, those geese seemed real; if I stared hard enough at them, they nearly flew out of the reeds and grasses. I was convinced, apparently, that they moved, and if I disappeared for any length of time, somebody would come to find me – I was always there, watching, waiting for that miracle. It’s strange: I’ve got four cartons of family photographs and papers that go back two hundred years – photographs of generations of families in my line; formal and casual portraits of parents and their young children, parents with their youthful children, parents with their adult children. ...but I’ve always wondered why this is the only photograph I have of my family – of my parents and my brother and me – all together. This week, Alan’s Sepia Saturday post called for contraptions – those oddball devices, usually hand-made by eccentric but well-meaning tinkerers in barns or workshops. We’ve all seen them, even used them. Some of us even still have them, stored in the attic or cellar, maybe, or out in the garage. This contraption, knocked together by my grandfather, was known affectionately as The Wheel, and was out in the yard in front of our summer home in Jaffrey, New Hampshire. It was, simply, an old wooden wagon wheel, tipped on its side and secured to an old axle pounded into the ground; every summer, after it was mounted properly and greased, it would spin around that post like a merry-go-round. You stepped into the wheel – your legs on either side of a single spoke – and then sat down on the rim, facing the hub. When we were all aboard, we kicked the ground with our feet, hung on for dear life as we went ‘round and ‘round. We defied common sense and centrifugal force on The Wheel – I remember (when I was older) my hair flinging out behind me as we went around; we’d get going fast, then hook our feet into the spokes, let go and lean out backwards – our parents would shriek in horror! I have a vague memory of my brother standing up on it, although I have no idea if it’s real or imagined! Amazingly enough, nobody ever got hurt on this thing: you’d need a helmet, elbow pads, knee pads and some kind of body armor to ride it today, and some Federal Safety Office would declare it unsafe, dismantle it, toss it away. This picture was taken in the late 1940s, when I was three or so. 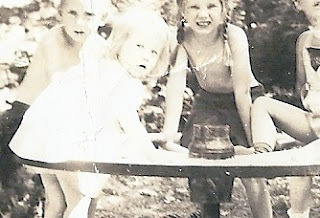 I’m the smallest one, the youngest cousin, that worried-looking blonde girl (front left) with the bare legs hanging down (see those Redball Jet sneakers? ); from there, clockwise around The Wheel: our neighbor Peter, my cousin Martha, and a little bit of my brother John, all of whom will grin if they log onto my blog this week. If I got on The Wheel today, I know I’d last about four revolutions before falling off...or throwing up -- guaranteed! NOTE: Be sure to take a spin over to http://www.sepiasaturday.blogspot.com to see what other Sepians have found!